A counter-depth refrigerator is merely one that will sit at the same depth as your cabinets and counter, meaning that it won't stick out beyond them. This improves the look of your kitchen and assures the appliance intrudes on your work space less. Refrigerators can be as deep as 36", but a counter-depth model won't exceed 30". All major manufacturers offer counter-depth refrigerators, and they come in a wide variety of finishes. 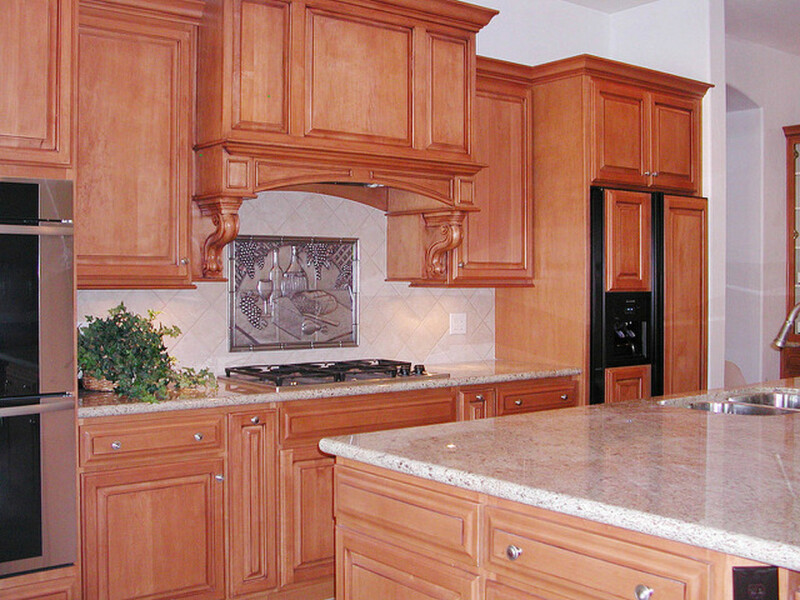 Some, in fact, require custom panels, which allows you to match your refrigerator to your cabinetry. On this page, you will find tips for choosing a refrigerator and see some of the most popular counter-depth models available. Choosing counter-depth refrigerators involves considering the same things as when buying any other refrigerator. Measure the dimensions (height, width, and depth) of the space you have to place the refrigerator. Subtract 1" from the top and sides to allow for clearance. This will tell you the largest dimensions you can consider for your new appliance. Don't forget to leave enough space for doors to open without hitting a nearby cabinet, wall, or appliance. Split doors such as on side-by-side models tend to require less space. Consider how much space you will need to store your food. For households with up to 3 people, a refrigerator offering an 18–22 cubic ft. capacity is generally enough. For larger households, a capacity of 22 cubic ft to 26 cubic ft is more typical. 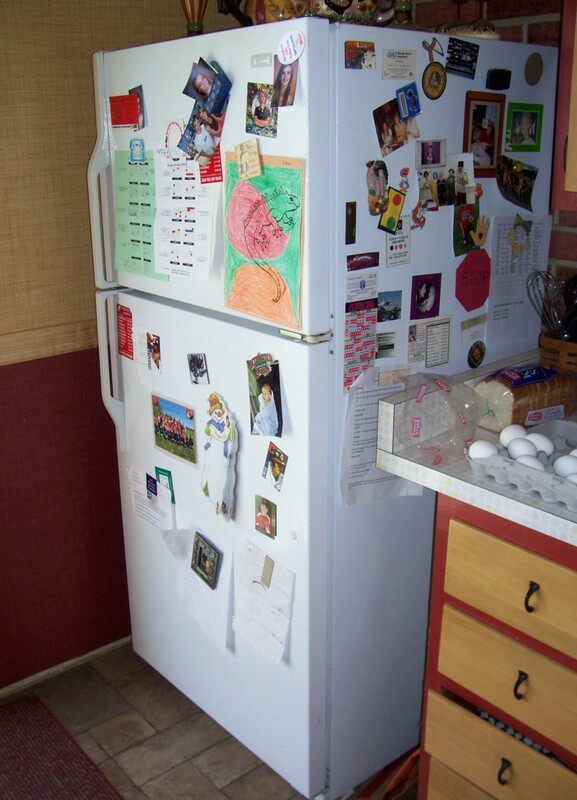 Refrigerators should remain 2/3 full at all times to operate efficiently, having a refrigerator that is too large isn't ideal for this reason. If you do a lot of freezing or consume a lot of frozen foods or ice, then don't forget to consider the capacity of the freezer as well. If you drink a lot of canned beverages you may want a special rack, tilt out bin, or dispenser for these beverages. In addition, if you will have jars, cans, or bottles with liquids, spill proof shelves can help contain spills. If you want more surface area or want to be able to see through shelves, tempered glass shelves are a better option than coated wire shelves. If you have many different sizes of items or occasionally need to fit in something extra large, adjustable shelves help assure that you can maximize space and fit in taller items. Half shelves can also help in getting just the right configuration. 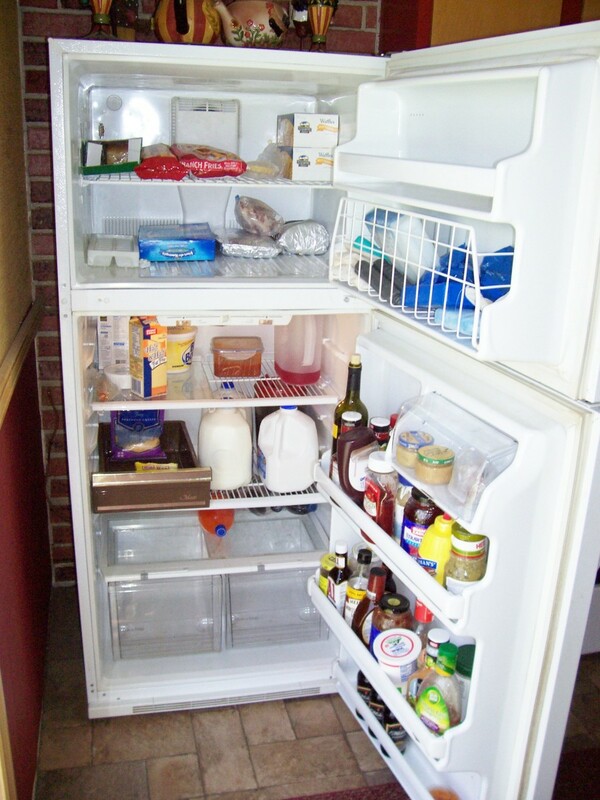 If you want quicker and easier access, pull-out or slide-out shelves can provide this. To better preserve produce or meats, separate bins for them can help control humidity and prevent premature spoilage. You can even find refrigerators that will offer separate temperature controls for these areas. Door bins are important to consider as well. Some offer see-through bins. Some have can dispensers. If you want to be able to put 2-liter bottles in the door or a gallon of milk in the door, you will need to have bins large enough to accommodate them. Consider storage configuration in the freezer as well. Some people prefer slide-out bins or tilt out bins for easier access. If you use a lot of ice be sure the ice maker can handle the volume you need. Some counter-depth refrigerators are top mount models with the freezer on top, others are bottom mount, and some are side-by-side. Side-by-side models offer doors that don't require as much clearance and are a bit lighter weight. Freezers on top put the freezer at eye level and the refrigerated items lower, while bottom mounted freezers reverse this, putting refrigerated items at eye level. There are also a variety of finishes offered which can complement the other appliances and overall decor of your kitchen. For the most flexibility, a counter-depth refrigerator that accepts custom panels is ideal. These allow you to use panels and handles that match your cabinetry. One of the most popular features is having ice and water access in the door so that you can get ice or water without having to open the refrigerator door. 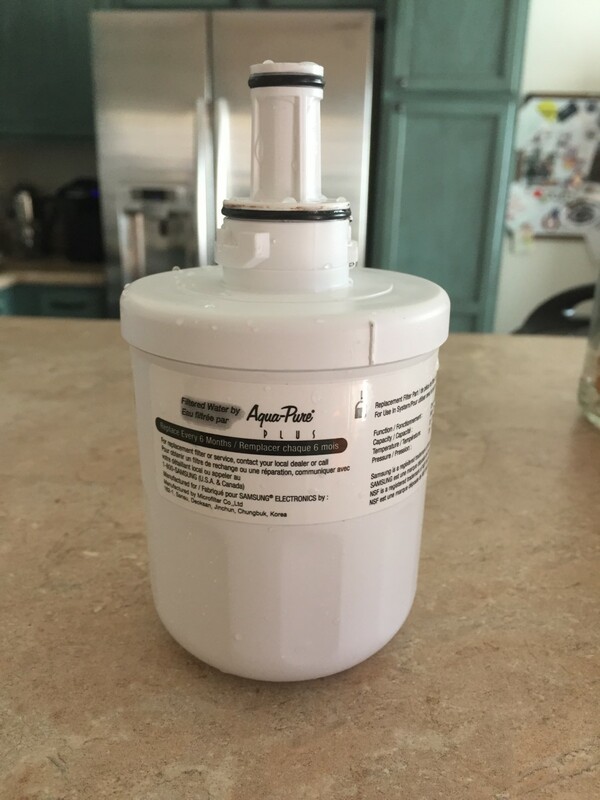 For the best tasting water, a model that includes a filter for this water dispenser is ideal. Of course, there are other features to consider, from easy access doors that allow you to retrieve frequently used items without opening the refrigerator, to televisions built into the door. Certainly, you will need to price shop based on your budget. However, it's important to consider operating costs as well. One way of looking at this is to consider the energy efficiency. Certainly, a counter-depth refrigerator that is Energy Star Qualified is a great indicator of an energy efficient unit. However, all appliances should have an energy efficiency label that can allow you to compare the annual energy usage/annual cost easily. For assistance in reading these labels, you can check out the Federal Trade Commission guide for reading the EnergyGuide label. You may also want to compare the warranty that the manufacturer offers to assure coverage if anything happens to go wrong. LG offers a number of counter-depth refrigerators. The LMX21984ST offers a 20.5 cubic ft capacity; 14.7 for the refrigerator and 5.8 for the freezer. It has french doors above and 2 drawers below. It includes a filtered ice-water dispenser, a 4 compartment crisper system, 2 humidity controlled crisper drawers, a full width Glide-N-Serve drawer, a bonus drawer, 4 spill protector glass shelves (3 slide-out and 1 folding), and 4 door bins. This refrigerator includes an automatic ice maker, auto defrost, LED interior lights, and safety features such as a child lock and door alarm. It offers a stainless finish, quiet operation, and measures 35 3/4" W x 30" D x 69 3/4" H.
The LG21CF offers similar features with a differet configuration; with 3 french doors. 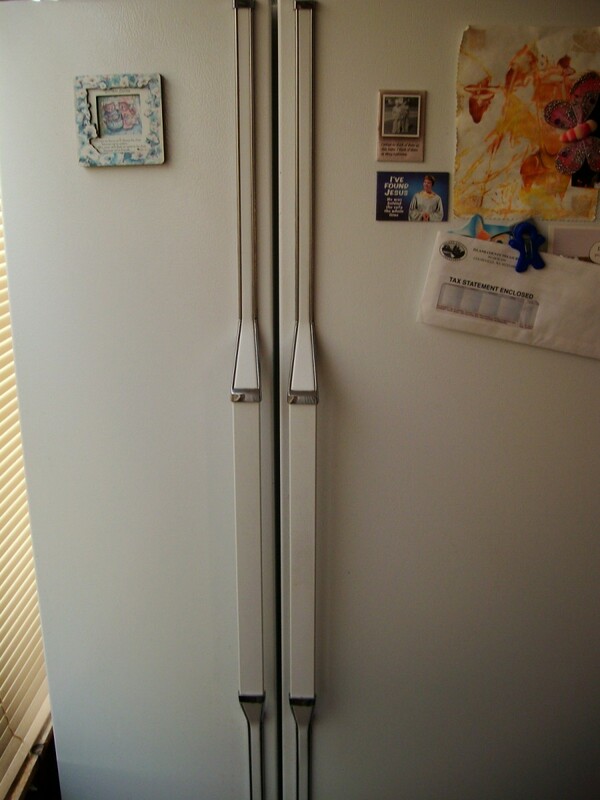 GE is another manufacturer of counter-depth refrigerators. The GE GSCS3KGYSS provides 22.7 cubic ft of storage with the freezer accounting for 8.26 cubic ft. It has a side-by-side design and a stainless finish. It measures 35.75" W x 69.25" H x 29.25" D.
This refrigerator features an in-door water & ice dispenser, interior lighting, 2 humidity controlled crisper drawers, 3 adjustable spill proof, slide-out glass shelves, an in-door beverage rack, and door bins that can accommodate gallon jugs. The freezer includes 4 door bins, 2 of which are adjustable and one that slides out. The CFCP1NlYSS is ideal for smaller households. It offers a 20.9 cubic ft. capacity (6.27 for the freezer) and measures 35.78" W x 69.5/8" H x 31" D. It has an automatic ice maker, water filter, precise digital termperature control, door alarm, interior lighting, and filter change indicator. In the bottom mount freezer, there are 3 slide out wire baskets, one of which is split. The refrigerator has 4 split adjustable shelves, 3 of which are spill proof/slide out, and 5 door bins. There is room for storing gallon jugs and it includes an in-door beverage rack. These are two of KitchenAid's counter-depth refrigerators. The KFC022EVBL offers a 21.8 cubic capacity (5.5 for the freezer). 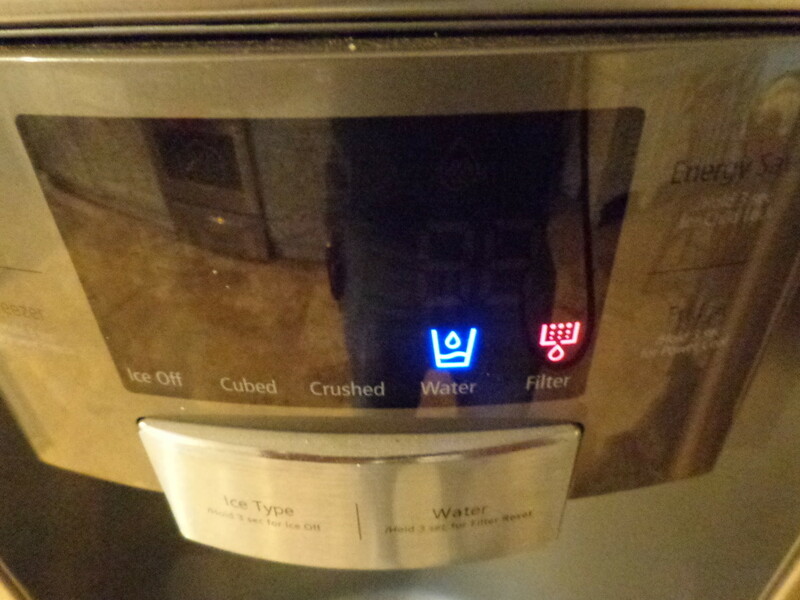 It features an interior water dispenser, automatic ice maker, a water filtration system and filter change indicator, a door alarm, temperature alarm, and an electronic temperature read out. This unit requires custom panels and handles. The freezer has a pull out tri-level drawer and the refrigerator has 4 adjustable spill-proof glass shelves, 5 door bins (2 gallon size), and a humidity controlled, see-through crisper. This frost free refrigerator measures 30 1/8" D x 71 7/8" H x 35 5/8" W.
The KSCK25FVSS offers more space with a 24.5 cubic ft capacity (9.6 for the freezer). It has a side-by-side design and stainless finish. It features a door alarm, an energy saving Holiday Mode, and an external temperature control.The refrigerator has a humidity controlled crisper, 4 adjustable, slide out, spill-proof shelves, 4 adjustable door bins, a wine rack and room for gallon jug storage. The freezer offers 3 baskets, one which slides out. This unit also features an external ice/water dispenser with a PuR water filtration system. It measures 30" D x 71 3/4" H x 35 5/8" W.
Available in a variety of finishes, the Whirlpool GC5SHAXVS has a stainless finish and offers 24.5 cubic feet of storage. It is a side-by-side counter-depth refrigerator measuring 71 7/8" H x 30 1/8" D x 35 5/8" W. It features an automatic ice maker, in-door ice/water dispenser, PuR water filtration system, auto pulse defrost system, and an ice bucket you can tilt out and remove with one hand. There are 3 adjustable, slide out, spill guard shelves, 3 adjustable clear gallon size door bins, a see through crisper, meat pan, and adjustable snack pan. The freezer offers adjustable shelves, tilt out door storage, and slide out wire baskets. 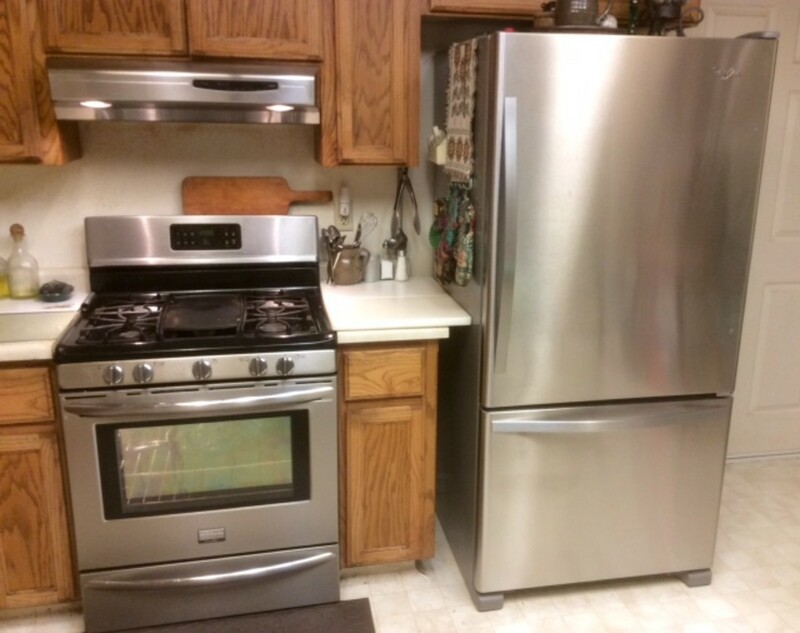 Here are two of Frigidaire's counter-depth refrigerators. The FFSC2323LS provides a 22.6 cubic ft capacity (8.5 for the freezer). It is a side-by-side design which offers an in-door ice/water dispenser with a water filtration system and water filter change alert. It has 4 door bins; 1 fixed gallon door bin, 2 adjustable 2 liter door bins, and 1 condiment bin. It also has 3 spill-safe sliding shelves and upper and lower see-through, humidity controlled crisper drawers. The freezer offers 4 door bins, 3 wire shelves, an ice cream shelf, and 1 wire freezer basket. This unit has interior lighting and will automatically go into energy saving mode if it is not opened for 24 hours. It measures 36" W x 69 3/8" H x 26 7/8" D.
The FGHC2334KE 36 offers similar storage capacity and features with a black finish. Samsung's RSG257AARS provides 24.1 cubic ft of storage space with 9.1 cubic ft dedicated to the freezer. This counter-depth refrigerator has a side-by-side design, LED lighting, and in-door automatic ice maker, ice/water dispenser, with filtration system, door alarm, and water filter indicator.The refrigerator offers 4 spill-proof glass shelves, a wine rack, egg container, dairy compartment/crisper drawers. The freezer has 3 tilting door bins, and 4 shelves. This unit also provides a fast chill and fast freeze feature. It measures 35 15/16" W x 30" D x 70" H.
The RFG237AABP has a black finish and a 23 cubic ft capacity. It also has the in-door filtered water and ice dispenser, LED lighting, a power freeze and cool option, door alarm, and water filter indicator. The refrigerator has 2 humidity controlled cripsers, a dairy compartment, egg compartment, wine rack, 5 spill proof glass shelves, and 2 gallon door bins. 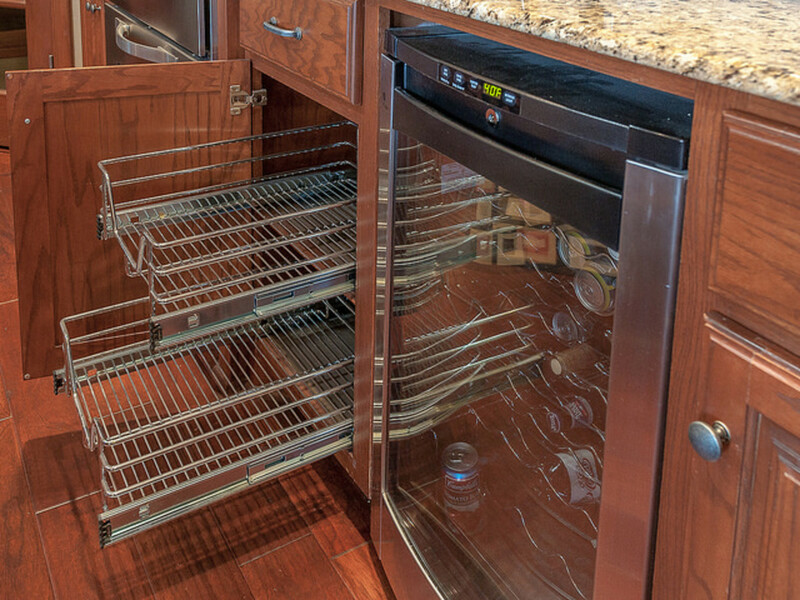 The freezer offers 2 drawers and an auto pull-out, clear, upper freezer drawer. It measures 35 3/4" W x 68 1/2" H x 29" D.
Here are two counter-depth refrigerators from Elecrolux. The EI23BC51IW provides a 22.6 cubic ft capacity with 6.9 cubic ft in the freezer section. It has a bottom freezer, white finish, and french doors. It includes a Perfect Temperature drawer with a 28 to 42 degree F range which offers 9 preset selections such as cheese, shellfish, marinade, and thaw. It has 4 removable all glass shelves, left and right humidity controlled crisper drawers, 2 clear gallon door bins, 3 clear 2-liter removable door bins, one locking utility bin, and 2 tilt out can racks. This unit offers a Sabbath mode, electronic control water filtration, and alarms for door ajar, temperature, and power failure. The freezer has 2 gliding full-width baskets with adjustable dividers and an automatic ice maker. This unit measure 35 5/8" W x 28 3/16" x D 69 1/2" H.
The E23BC68JSS offers similar features and capacity with a fast freeze/fast ice feature, 7 door bins (3 half gallon door bins, and 1 tilt out) 4 fixed, split glass shelves, 2 humidity controlled crisper bins, wine bottle holder, can dispenser, 3 freezer baskets, and a stainless finish. This is a great hub. I just got a new fridge and it is flush with my other things in kitchen. This is great information. I didn't know they made counter depth refrigerators. I am planning to upgrade soon and always disliked how it stuck out. So now I know what to look for. Thanks. Voted up.